Written by: JWT Desk on September 15, 2018. Experts have been warning about water scarcity turning into a nontraditional security threat, and now military experts, including DG ISPR, have also alerted the nation that future wars would be fought on the issues of water. Unfortunately, it seems that these wars would be fought both within and across international boundaries. However, these wars would not be waged automatically. Only those countries would be vulnerable to these wars where water availability is turning into a challenge. Water availability in a country can be measured through more than one indicators. The most common are “per capita water availability”, “water poverty index”, “water availability to storage ratio”, and “water efficiency” etc. Unfortunately, all above mentioned measures reveal that Pakistan has become a water scarce nation. Our per capita availability has declined from “stress” to “scarce” condition. Most of whatever water is available is not fit for human consumption. We use 77 per cent of available water. Our storage is for one month only, and our water usage efficiency (water productivity) is one of the lowest. India is too facing a water stress situation and has an ambitious plan of building water reservoirs. The Indus Water Treaty between Pakistan and India has survived so far despite the wars and “cold wars” between the two countries. However, now Indian leadership is threatening to block water flowing to Pakistani rivers from India. Currently India’s plan is to construct 155 hydro power projects out of which 33 projects are on various stages of completion. Many water storage projects in India are in the pipeline. Most important are construction of Ratli Dam (690MW), Pikkal Dam (1,000 MW), Karthai Dam (1,190 MW), Kero Dam (600 MW) and controversial Kishanganga Dam. As per Indus Water Treaty, India can use water but cannot block or negatively affect the water quantity flowing to Pakistan. In the era of technology, measuring the water flow through remote sensing hydro telemetry is not a difficult task, but India does not agree to install one and that is leading to dispute on water between Pakistan and India. Lack of authentic data is one of the reasons Pakistan lost its case in international court of arbitration. If the water dispute between the two nuclear states is not resolved either bilaterally or through mediation/arbitration of third party/parties then Pakistan not only risks major shortage of water for its agricultural usage, which contributes 24 per cent of its GDP, but the region also is vulnerable to a war between the two states. Currently India’s plan is to construct 155 hydro power projects out of which 33 projects are on various stages of completion. Many water storage projects in India are in the pipeline. The water war would not be limited to the two countries. In fact, with the growing scarcity of water, the chances of water war within the country are even higher. Unfortunately, after construction of Tarbela and Mangla dams, our decision makers did not pay any attention to water storage. Water issues kept getting ignored amidst political instability and societal polarisation in Pakistan. Provinces could never develop consensus on water storage facilities and talking of dams became a taboo in the country. At national level the signs of water mismanagement are ubiquitous in the form of water scarcity and resource depletion. Climate change is further aggravating the problem. Due to rising temperature and shift in rainfall patterns, we have either too much rain over a short span of time or no rains for extended period of time. Both results in water havoc in the absence of water storage; either too much of water (floods), or too little of water (droughts). This may be the triggering point for water war within its federating units. Within Pakistan’s federating units, the surface water is distributed as per “Pakistan’s Water Apportionment Accord 1991”. According to this accord, Punjab and Sindh receive most of the water i.e. 49 per cent and 43 per cent respectively; Khyber Pakhtunkhwa receives 5 per cent, whereas Balochistan receives only 3 per cent of available surface water. As the available kitty of the total surface water in Pakistan is shrinking, provinces have started expressing reservations on this water distribution formula, leading to disputes among provinces, especially Sindh and Punjab. Shortage of surface water and absence of ground water regulatory measures have resulted in injudicious extraction of water for domestic and agricultural usage. Resultantly ground water is depleting at an alarming rate. Pakistan receives 145 million acre feet water annually but can only store 13.7 million acre feet. On the other hand, our daily water requirement is 40 million acre feet. As per recent estimates Pakistan’s fresh water shortage would be around 31 million acre feet of water by the year 2025 if the present mismanagement persists. This is alarming for almost 70 per cent of population of the country that is dependent on agriculture directly or indirectly. Energy subsidy on water tubewells is also leading to indiscriminate water extraction; most of which gets wasted because of bad agricultural practices. If the situation persists, then we would be vulnerable to another water war at local level, where each one of us would try to extract maximum share of ground water, virtually leaving nothing for our future generations. So we have three water wars looming on us, international, national and local. For averting international water war, we need to put pressure on India to start using remote sensed hydro telemetry system. We need to assess how much of Pakistan’s rightful share of water is being stored and diverted in India. At home front, we need to strengthen our Indus Water Commissioner’s office through technology, but also through provision of capable human resources who may watch Pakistan’s water interests. At national level, in the run up to general elections 2018, voters have to urge political parties to present their water plans. Last general elections were contested on energy issues. I hope that next elections would be contested on water issues, and citizens of Pakistan would vote in the political party which has devised the most doable plan to tackle water problems. In this context, all political forces should evolve a consensus on increasing water storage in Pakistan. 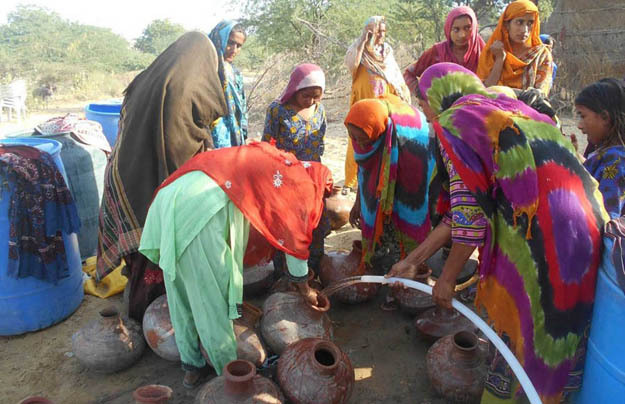 Water storage is Pakistan’s lifeline and cannot be left to be a victim of petty politics. To avoid local water wars, all of us need to mend the ways we use water — starting from our domestic usage to agricultural and industrial usage. We need to be mindful of the fact that Pakistan has already depleted its natural gas through its injudicious use and soon this is going to happen with water. This post has been seen 2030 times.